For years China’s been toying with the idea of building a massive bus that straddles multiple lanes of cars to move commuters without creating a traffic mess. To date, it’s only existed as fancy computer renders and animations. But starting today a real-life version starts testing in Qinhuangdao, China. 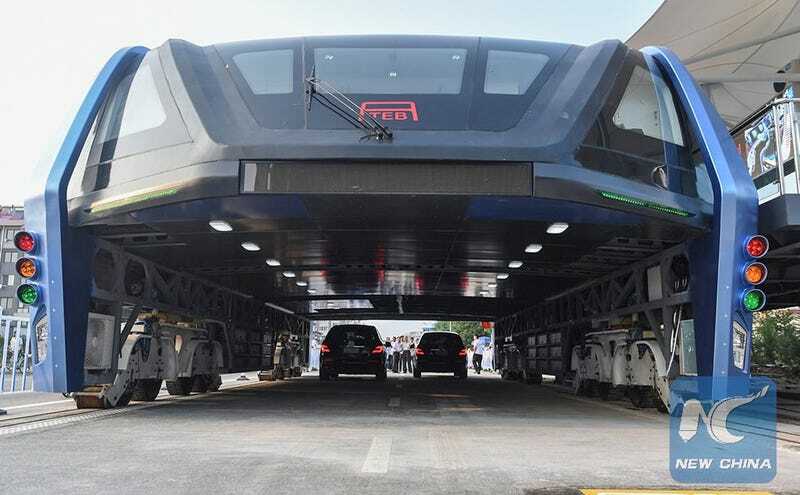 The first working version of the straddling bus isn’t quite ready to handle the mean streets of Qinhuangdao yet. For testing purposes, the bus is limited to a 300 meter long track, with limited turns and traffic challenges. But it’s the first step towards something like this actually going into full service one day. If the bus does end up being agile enough to handle a wide variety of streets and traffic conditions, it could one day carry upwards of 1,200 passengers at speeds of close to 40 miles per hour. These are ambitious goals, for sure. But adding a fleet of these buses to a crowded city center would be hundreds of millions of dollars cheaper than introducing new subways or elevated trains to help ease congestion.